The Good Enough Professor: 41% or 76%? 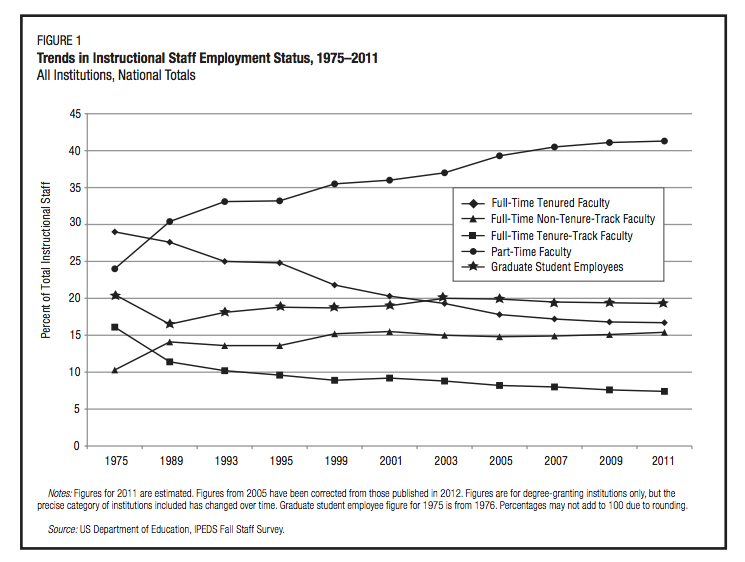 So rather than claiming, "76% of instructional staff are adjuncts," it would be more accurate to say "76% of instructional staff are not tenured"--and as Bruenig points out, that 76% combines the 41% of "part-time faculty" with 16% "full-time non-tenure-track faculty," 19% "graduate student employees" and, most damningly 7% "full-time tenure-track faculty." But the claim that "41% of instructional faculty are adjuncts" is also misleading, as is the frequent conflation of "part-time" faculty with "adjunct faculty." Not all adjuncts are part-time. Not all full-time faculty get the protections, salary, and institutional validation of tenure-stream faculty. Nor should graduate employees be set entirely apart from the exploitative labor practices of higher ed. Programs that accept more graduate students than they can place on the market in order to staff lower-level courses are exacerbating a labor problem, not solving it. Some institutions also devise non-faculty designation for instructional staff who teach service courses, particularly foreign languages, so some people who deliver instruction and look for all the world like "faculty" may slip through the cracks of a survey like this. The real question, though, is not one that can be answered by a survey that counts bodies and job titles. Who is actually teaching college students? This set of numbers flattens meaningful distinctions between teaching loads and student contact hours. Full-time plus part-time non-tenure-stream faculty make up only (!) 57% of the warm bodies employed in higher ed, but they may well be doing far more than 57% of the teaching offered by their institutions. And how large a percentage is too large?